Objective: Given a binary Tree and two levels, Print all the nodes between those. 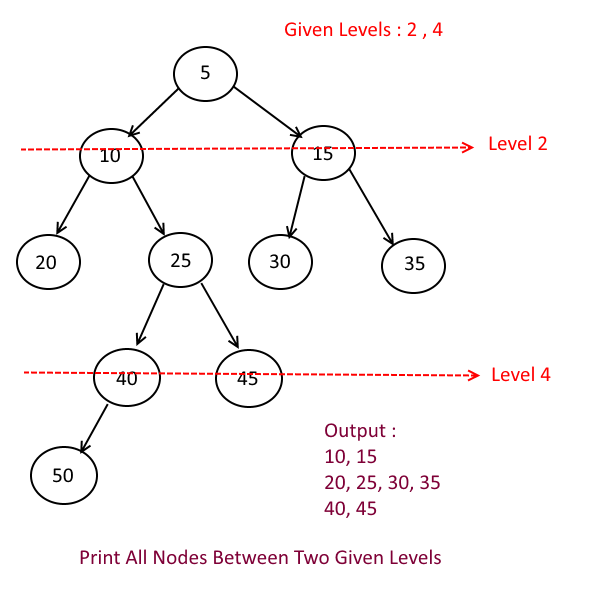 Input: A Binary Tree and two levels. Output: Print all the nodes between given levels. The solution of this problem is very simple, Do level order traversal and in recursive calls first add the right child and then left child. Take a global variable say, currLevel which will store the current level while doing Level Order traversal. Print only nodes between given levels. Read this solution “ Level Order Traversal, Print each level in separate line” and implement the above approach. Next story Sort an Array such that the odd numbers appear first followed by the even numbers . The odd numbers in ascending order and the even numbers in descending order. 224 queries in 0.108 seconds.